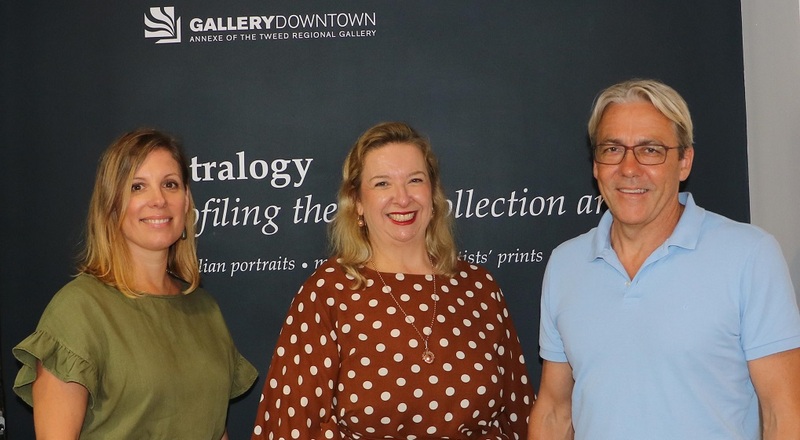 Gallery DownTown Curator, Ruth Della, with M-Arts founder Stephen Webb and Tweed Regional Gallery & Margaret Olley Art Centre Director, Susi Muddiman. The Gallery DownTown is the new annexe of the Tweed Regional Gallery & Margaret Olley Art Centre. An initiative of Tweed Shire Council, and housed within the creative hub of Murwillumbah’s vibrant M-Arts Precinct , the new initiative aims to act as a driver of creative and economic development for the area. The Gallery DownTown’s recently appointed Curator, Ruth Della, has a background in both the arts and business. She was the Creative Director of the highly successful SWELL Sculpture Festival on the Gold Coast for 11 years however started her career somewhere very different – a stockbroking firm. M-Arts founder Stephen Webb said the addition of the Gallery DownTown to the precinct would add to the quality of the arts scene and bring more visitors into town. “We’re hoping to be the catalyst for many more initiatives along these lines – to bring the art out in the open and the people to art – for Murwillumbah to become known for its impressive art scene,” Mr Webb said. The M-Arts Precinct has become a focal point of creative activity in the region, presenting commercial exhibitions fostering the work of artists of the area and supporting creative development through workshops and tutorials. The Gallery DownTown is open Monday to Wednesday and Friday from 10am to 3pm and Saturday 10am to 2pm. It is closed Thursday and Sunday.